One of the hottest current topics in the real estate industry is mold. The recent attention surrounding it is somewhat of a oddity considering that mold is a naturally occurring substance that has been around since the beginning of time. However, these facts are not meant to belittle the importance of maintaining a healthy, mold-free house. The presence of mold has been linked to various physical ailments that can affect the overall health of the occupants of the house. People with a history of respiratory problems are most likely to be affected by the presence of mold in a house. Now of these three conditions, only moisture can realistically be taken out of the equation. Houses are constructed with wood and the comfort range for humans falls within the same temperature range needed for mold growth. Moisture is the most controllable of the three conditions and therefore, must not be allowed to enter the home. This is most easily accomplished through the proper installation and placement of gutters and downspouts and by maintaining proper exterior grades to divert water away from the house. Moisture cannot be completely eliminated from a house. Some level of humidity is needed in the air to maintain air quality and comfort. This is often accomplished through normal household activities such as showering and cooking. Plants also contribute to the overall humidity levels in your house and are beneficial. The key is to maintain a safe moisture level without contributing to mold growth. There are interior house conditions that can provide too much moisture. One is an improperly vented clothes dryer. Some people think venting their dryer to the interior of the house will help heat their house. Not only is this type of set up considered a fire hazard, but all the moisture from a load of laundry is vented into one confined area. The weight difference between a dry and wet load of laundry is at least 10 pounds and it’s all water weight. Discharging that much moisture inside a confined area of the house creates conditions conducive to mold growth. All dryers, gas or electric, must be properly vented to the exterior. Other conditions that can provide too much interior moisture are leaking pipes, lack of ventilation in a bathroom used for bathing, or a leaking roof. Gas-fired appliances such as a water heater or furnace also produce moisture through combustion. 90% of the residue from gas combustion gases is moisture. If one of these appliances doesn’t vent properly, the moisture in the gases can seep back into the house along with dangerous carbon monoxide gases. Cleaning methods and solutions generally are not long term solutions to mold removal. They may appear to remove mold growth but the mold will likely return and spread. If mold is present in an area of the house, the best way to remove the mold permanently is to have the damaged material replaced and the moisture source eliminated. An important fact to keep in mind is that conditions conducive to mold growth are also conducive to the presence of termites. Therefore, preventing mold growth can also help prevent termite presence. 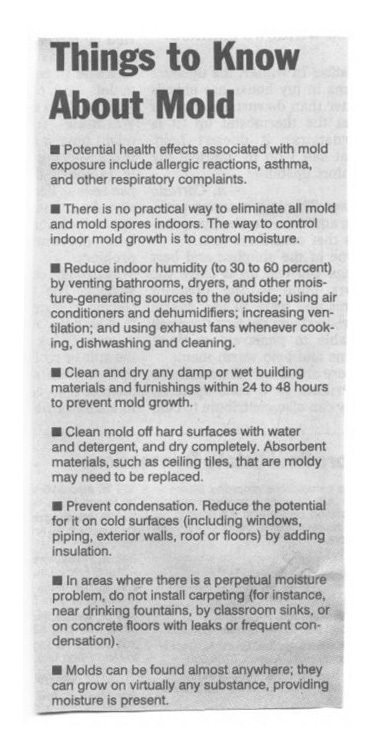 Below is a reprint from an article in the Philadelphia Inquirer on Things to Know About Mold.